State Sen. Daniel Biss (D-Evanston) speaks at a panel Sunday. 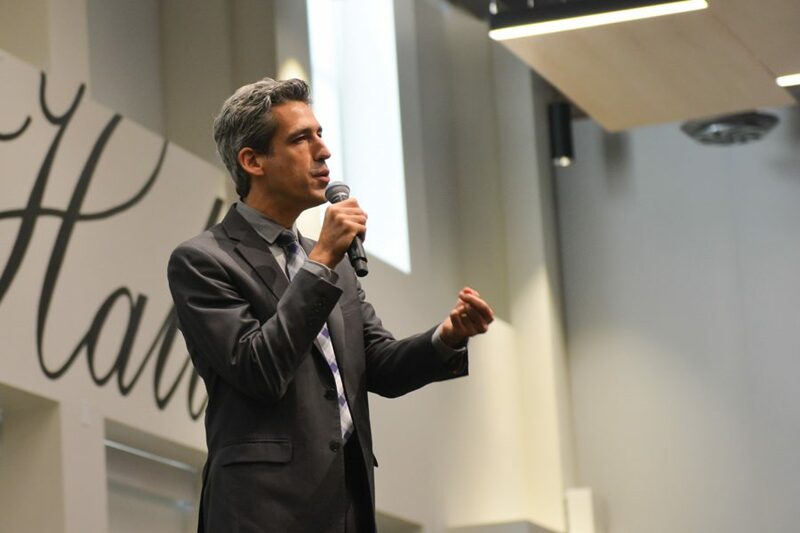 Biss and six other Democratic gubernatorial candidates advocated for free college tuition and a single-payer health care system. CHICAGO — Seven Democratic gubernatorial candidates advocated for free college tuition and a single-payer health care system at a Sunday panel event in Chicago. More than 500 people attended the event, which was hosted by the Chicago Teachers Union and Our Revolution, an advocacy group that supports progressive candidates. The panel was co-sponsored by more than 50 progressive organizations across the state. State Sen. Daniel Biss (D-Evanston), regional superintendent Bob Daiber, community organizer Tio Hardiman, Skokie business owner Alex Paterakis, Chicago Ald. Ameya Pawar (47th), businessman J.B. Pritzker and businessman Chris Kennedy participated in the discussion. Candidates expressed their support for free college tuition in Illinois, but disagreed on its implementation and cutoffs for eligibility. Pawar said free tuition is the only gateway to the middle class for people from poorer backgrounds. Pawar and Biss both said they oppose income cutoffs for free tuition, which they said would hinder equal access to college. To fund the tuition initiative, Biss suggested applying a progressive income tax, which would effectively tax higher-income earners more heavily than low-income individuals. Other candidates expressed more cautious support, with some saying Illinois should first make community college free and eventually cover tuition for all public four-year universities. Kennedy (Kellogg ’94) said he supports free tuition — especially for community colleges — but believes there should be an income cap between $120,000 and $150,000 a year. He said he wants to standardize the cap across the state’s public colleges. Illinois currently funds community college tuition partly through property taxes, which Kennedy said is not the best method. The state won’t raise property taxes anytime soon, even to help fund tuition legislation. The Illinois State Senate announced in May a two-year property tax freeze, a compromise on Gov. Bruce Rauner’s call for a permanent freeze. In addition to tuition, the candidates touched on health care expansion at Sunday’s event. Over the past several months, President Donald Trump and Republican lawmakers tried and ultimately failed to repeal the Affordable Care Act, bringing increased national attention to the issue. The attending candidates reaffirmed their support of single-payer health care in Illinois, and many stressed the importance of implementing change at the state level instead of waiting for national legislation to catch up. But Pawar said insurance companies and private interests would create another roadblock to establishing the new system. He said single-payer health care would be pro-business and drive down costs for small businesses, which does not align with large insurance companies’ interests. Candidates later touched on issues surrounding police brutality, the minimum wage and school vouchers during the panel. Christopher Kruger, an Evanston resident who attended the panel event to support Biss, said overall, the panelists pushed a unified progressive agenda despite their differences. “I’m glad to see all the candidates coalescing on those values,” Kruger said.